BRISTOW -- There's a line in Tom Petty and The Heartbreakers' "Mary Jane's Last Dance" that goes, "You never slow down, you never grow old." The band seems to have taken the lyric to heart, churning out chart-toppers in the studio and onstage for the last three decades. The group is celebrating 30 years together with a tour that stopped at Nissan Pavilion in Bristow last weekend. With the opening of the very first song, "Listen to Her Heart," everyone in the manic audience shot to their feet, where they remained, cheering and dancing. Having clearly learned a thing or two during their time together, Petty and his ace bandmates -- bass player Ron Blair, keyboardist Benmont Tench, guitarist and harmonica player Scott Thurston, drummer Steve Ferrone and guitarist Mike Campbell, whom petty called the band's co-captain, played hits like "You Don't Know How It Feels" and "Free Fallin'" with unfailing precision, but the players had that extra energy that comes from performing live. The audience, which almost drowned out the band at times, fed off that energy, and there was an electricity in the air that made everyone go nuts every time Petty said a word. He must be used to this sort of thing by now, but he seemed truly in awe as he raised his arms and thanked the audience after each song. 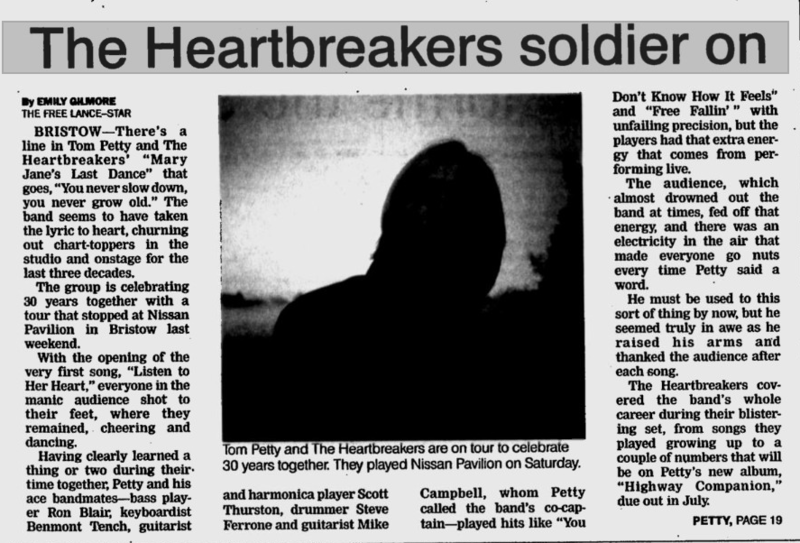 The Heartbreakers covered the band's whole career during their blistering set, from songs they played growing up to a couple of numbers that will be on Petty's new album, "Highway Companion," due out in July. 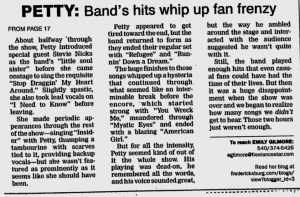 About halfway through the show, Petty introduced special guest Stevie Nicks as the band's "little soul sister" before she came onstage to sing the requisite "Stop Draggin' My Heart Around." Slightly spastic, she also took lead vocals on "I Need to Know" before leaving. She made periodic appearances through the rest of the show -- singing "Insider" with Petty, thumping a tambourine with scarves tied to it, providing backup vocals -- but she wasn't featured as prominently as it seems like she should have been. Petty appeared to get tired toward the end, but the band returned to form as they ended their regular set with "Refugee" and "Runnin' Down a Dream." The huge finishes to those songs whipped up a hysteria that continued through what seemed like an interminable break before the encore, which started strong with "You Wreck Me" meandered through "Mystic Eyes" and ended with a blazing "American Girl." 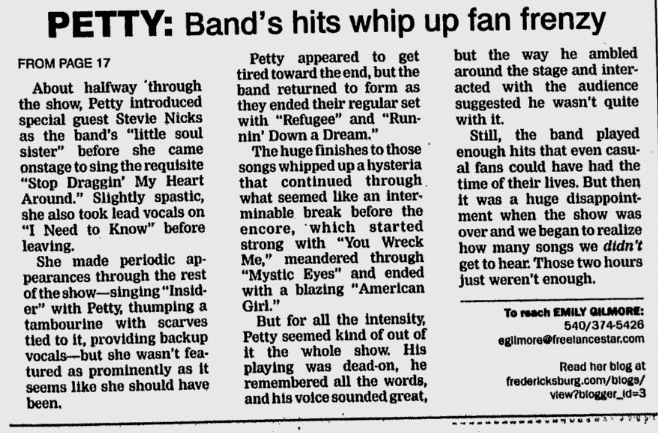 But for all the intensity, Petty seemed kind of out of it for the whole show. His playing was dead-on, he remembered all the words, and his voice sounded great, but the way he ambled around the stage and interacted with the audience suggested he wasn't quite with it. Still, the band played enough hits that even casual fans could have had the time of their lives. But then it was a huge disappointment when the show was over and we began to realize how many songs we didn't get to hear. Those two hours just weren't enough.